It is extremely important not to neglect working your forearms during your exercise routines. The hands, wrists, and forearms should be prioritized while warming up and while working out. Below, we recommend several stretches and essential exercises that will allow you to build strong and symmetric forearms. So often, the biceps and triceps are the focal point of upper extremity development, while the forearms and wrists are given minimal attention. But the forearms and wrists allow us to perform the exercises that develop and maximize biceps, triceps, deltoid, chest, and back strength. 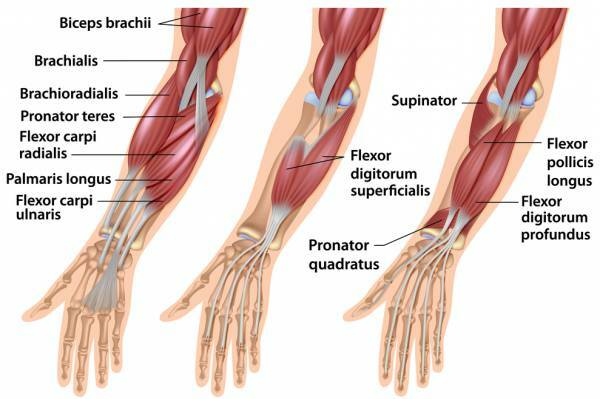 Therefore, it is imperative that we devote time and energy to optimize the strength of our hands, wrists, and forearms. Here are seven essential tips to really help you to develop strong and symmetric wrists and forearms. We recommend doing these exercises three times per week. Flex and extend all fingers, while making a complete fist for 30 seconds. Next, open and close your fingers do 2 sets of each for a total of a minute. Flex your wrist and hold in maximum flex for 30 seconds with the elbow straight but not locked. Extend your wrist with the elbow straight for 30 seconds. Do 2 sets for a total of 2 minutes. These initial three stretching exercises will prepare you for the more complex and more intense weight-bearing exercises to optimize muscular development and the strength of the forearm. Seated Wrist Hammer Curls – In a seated position with your back straight, place your forearm on your thighs with your thumbs pointed upward. Use a 5-, 10-, or 20lb weight in a hammer position and lift it back and forth slowly for 3 sets of 20 repetitions. 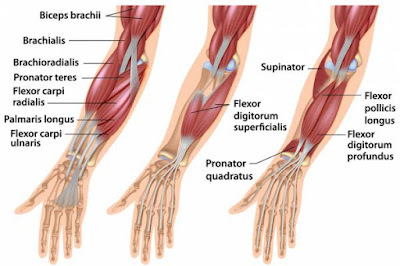 This will develop your brachioradialis muscle, which inserts at the distal aspect of the forearm at the wrist. Greater hypertrophy of this muscle will give more definition and balance of the forearm. Seated Wrist Straight Curls – This is to develop your flexor muscles. In a seated position, with your forearms on your thighs and palms facing upward, with a 5-, 10-, or even 20lb weight in hand, flex your wrist upward. Keep the forearms well placed against your thighs for greater stability and isolation of the wrist and forearm musculature. Be careful to place the wrist three to four inches away from the knee to allow the full range of motion. Do 3 sets of 20 repetitions. Seated Reverse Wrist Curls– This is to develop your extensor muscles and is also done in a seated position with your forearms on your thigh, palms facing downward, with the wrist three to four inches away from the knees. Grasp the weight and extend the wrist fully. Do this for 3 sets of 20 and be sure to not lift the elbows from the thighs when extending the wrists. Keep the palms down. Finger Curls – This is an easy exercise to perform and will develop finger and hand strength. Simply sit and hold a 5-, 10-, or 15lb in weight your hand. Turn your hand with the palm upward with the back of your wrist on your thigh. Allow the weight to roll down your fingers, and now curl your fingers back holding the weight securely. Remember to keep the back of your wrist against your thigh throughout the execution of the exercise. Use weight which you can effectively control and execute the exercises properly. Ultimately, these seven exercises will help to maximize the strength and contours of your hand, wrist, and forearm. This increase in the overall strength of your upper extremities will also help to improve your hand and wrist dexterity, which in turn can improve competitive performance in athletics, gaming, and even in day-to-day tasks.